•	Course : You’ve placed so much effort behind developing your project. This course guides you through the best way to get impact for your music within the public and media marketplace. •	Includes: Private tutoring sessions, one-hour Presentations & Q&A. •	Course Duration: At your pace, minimum 2 weeks maximum 4 weeks. •	Suited to: Music Creatives and those working to develop Music Creatives career. •	Course : In an age where ‘brand’ is becoming the most important element of an artist career, understanding the value and benefits of branding is King. Review and explore how your brand can work for you. •	Includes: Private tutoring sessions, one-hour Presentations & Q&A. •	Course Duration: At your pace, minimum 2 weeks maximum 4 weeks. •	Suited to: Music Creatives and those working to develop Music Creatives career. •	Course : Preparing for a Digital launch, make your launch count! This course reviews the requirements, formulas and strategies for the digital launch of your music. •	Includes: Private tutoring sessions, one-hour Presentations & Q&A •	Course Duration: At your pace, minimum 2 weeks maximum 4 weeks •	Suited to: Music Creatives and those working to develop Music Creatives career. •	Course : Hosting an event, big or small has its challenges. This course looks at the various aspects of event development, structuring teams and producing the day. •	Includes: Private tutoring sessions, one-hour Presentations & Q&A •	Course Duration: At your pace, minimum 4 weeks maximum 6 weeks •	Suited to: Music Creatives and those working to develop Music Creatives career. •	Course : Are you ready to tour locally or internationally? This course delivers the journey and insights of ensuring the viability, purpose and profitability of touring. •	Includes: Private tutoring sessions, one-hour Presentations & Q&A •	Course Duration: At your pace, minimum 4 weeks maximum 6 weeks •	Suited to: Music Creatives and those working to develop Music Creatives career. 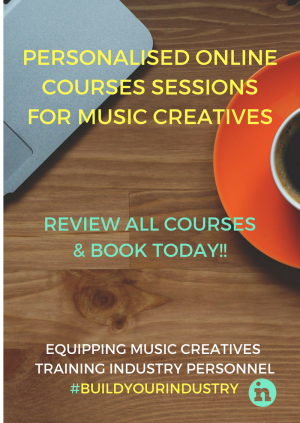 INfocus courses affordable, in-depth, online personalised tutoring that provide 'How-to' courses for music Creatives. Courses are aimed at equipping and training Music Artists, Music Creatives and industry personnel for direct application and career impact. All courses are delivered in one hour presentations & Q&A with industry tutor via link to a private online platform. Course Charges: Listed price is per one session (introductory cost until May 2018). Course delivery: All sessions booked and delivered via online webinar link.